This piece of Blossoomer and Blossoomer fan children fan art, which is part of BrickercupMasterX3’s annual Blossoomer month, is dedicated to Zuzanna aka niziolek and Alex aka SportyArtist who are celebrating their birthdays today. So, I wish you a lot of love, joy, happiness, fortune, beauty, strength, abundance, and prosperity on your very special day as well as in your lives as artists and as people. This is also dedicated to all of the Blossoomer shippers and, as you can tell, this is in honor of the Chinese New Year, more specifically with 2019 being the Year of the Pig. So, Happy Chinese New Year or Kung Hei Fat Choi to you all, sit back, relax, and soak in that Blossoomer goodness. 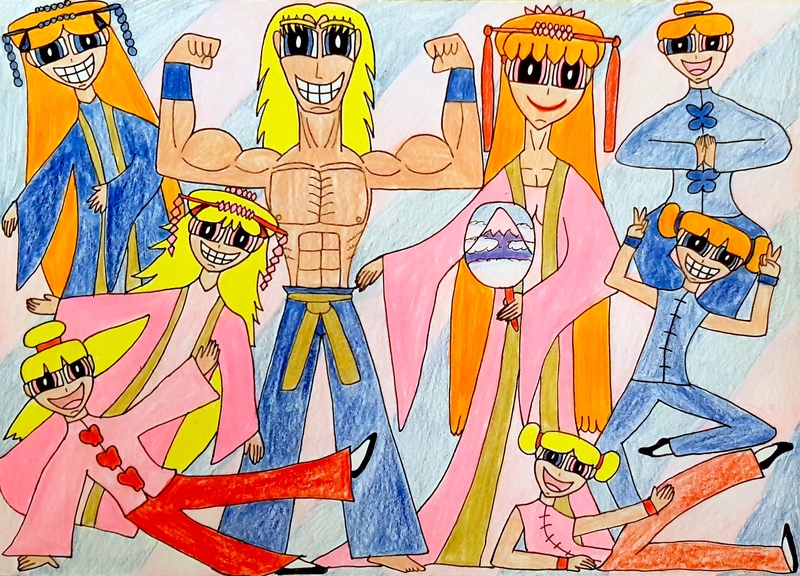 Here we have 26 going on 27-year-old Boomer, his 25 going on 26-year-old life partner Blossom, and their beloved 7 going on 8-year-old sextuplets Bloom, Brittney Jane aka BJ, Beau, Brian, Becky, and Bella Donna aka Belladonna celebrating their Chinese New Year in style. 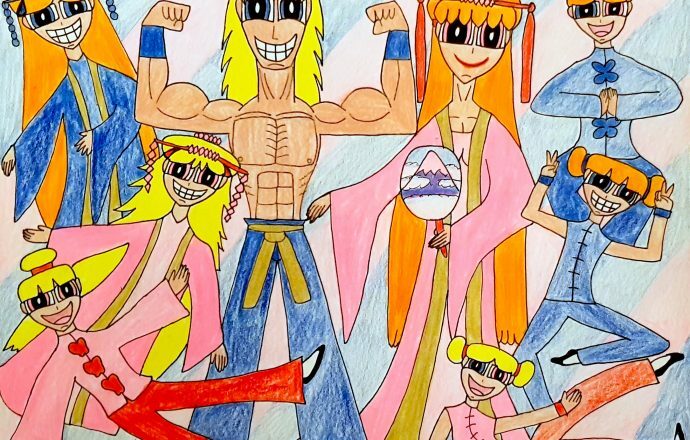 Boomer is dressed as a traditional Chinese martial artist, as he gets to expose his glorious upper body for his beloved Blossom and his children to see. Blossom is dressed as a beautiful Chinese noblewoman and, therefore, looks as elegant as ever. Bloom and BJ are also dressed as Chinese noblewomen. Beau and Brian are dressed akin to Chinese noblemen of the court. Finally, Becky and Belladonna are dressed as Shaolin Kung Fu fighter girls. This should come off as no surprise that Blossom’s affiliation with the Chinese language, more specifically Cantonese, has been ingrained with her since childhood and, therefore, loves exploring Eastern culture and tradition. Hence, every Chinese New Year, she and Boomer would be dressed to the nines in their attires with their children following suit. It also helps that Bloom, BJ, Beau, Brian, Becky, and Belladonna are very diligent when it comes to studying both Cantonese and Mandarin as well as Chinese culture, history, lifestyle, and tradition in general. I hope you all enjoyed this piece of Blossoomer fan art and from me, my family, and my friends to yours, have a most prosperous, awesome, and blessed Chinese New Year. Take care, everybody. Boomer and Blossom from The Powerpuff Girls belong to Craig McCracken and Cartoon Network. Bloom, Brittney, and Becky belong to KatyGorl. Beau, Brian, and Bella belong to Misse-the-cat and KatyGorl.